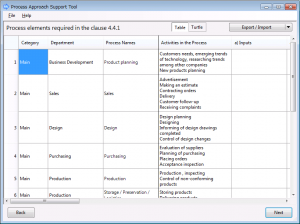 Software for Microsoft® Windows Process Approach Support Tool｜TECHNOFER LTD.
Are you worried about how to apply a the process approach to your organization ? This software solves it ! This software supports how you apply a process approach, that ISO 9001:2015 requires, to your organization ! You can realize new ISO 9001:2015 requirements and your business processes. You can introduce an enhanced process approach into your organization. You can establish your QMS in compliance with ISO 9001:2015 with engagement of all people in your organization. “Ensuring integration of QMS requirements into the organization’s business processes” is newly required in the section 5.1.1 c) of ISO 9001: 2015. It is a requirement in order to combine the organization’s QMS requirements and the organization’s activities in compliance with ISO 9001:2015 together. In order to do so, it is necessary to understand the process approach definitely, improve quality throughout the organization as a whole and establish a management system to pursue customer satisfaction. Depth of review that should be required in a ISO 9001: 2015 certification audit are deepened to such extent. A key point for it is the requirements of the clause 4.4 “Quality management system and its process”. 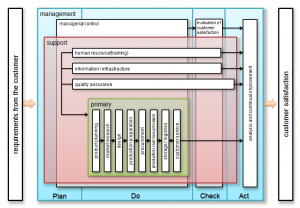 (1)Supports application of a process approach with six steps. Determine business processes in the organization. Hierarchy of a process（process, sub-process, sub-sub-process） can be represented in the input screen. 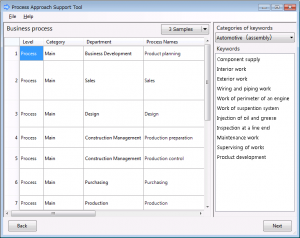 Determine the processes needed for the QMS among the business processes. Complete the column of the inputs, outputs, etc. for each process as required by the clause 4.4.1 of ISO 9001: 2015 standard. You can choose a turtle diagram as well as a table format, which meet the requirements of the clause 4.4.1 a) to h). Determine which requirements each process is associated with, and check that there is no requirement that is not integrated into any process. Then determine requirements that are not applicable to your processes, and provide justification for it. Step 5. Using the created data in the certification audits. Export data created by this software as Microsoft® Excel® (*. xlsx) or CSV (comma-separated text, *. csv) file. It can be utilized as a reference documents of the QMS manual and also in the certification audit. 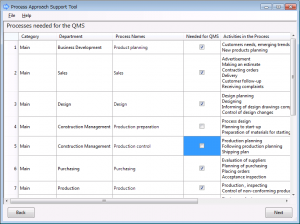 Assists in creating a flow chart of QMS processes. A sample file of Microsoft® PowerPoint® are attached. (2)Samples of three industries (manufacturing, construction and service) to help you to determine your business processes and sample key words of the 28 industries that are frequently used in establishing or reviewing processes can be used as a reference. (3)Determine and confirm followings that are required by ISO 9001:2015. Samples can be used as a reference. (4)You can obtain six deliverables (documents) that are useful in a transition. A document that demonstrates you have determined applicability of the QMS and provided justification for any requirement that is not applicable to the scope of the QMS. It is somewhat different from the standard turtle diagram, and it consists of elements is in accordance with the clause 4.4.1 of the ISO 9001: 2015. It can be exported in Microsoft® Excel® format (*. Xlsx, Excel 2007 or later format), or HTML format. As a table of a name and content of each business process. 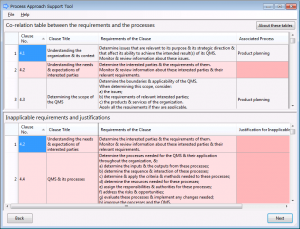 As a table created after you select the process needed required for the QMS among your business processes. 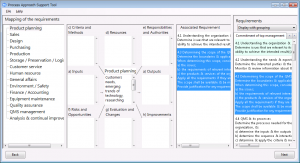 As data of a first input screen of the Step 4 to associate the QMS requirements with each process. 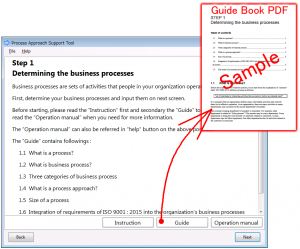 As data of an upper table in a second input screen of the Step 4 to confirm what processes are associated with each requirement. As data of a lower table in a second input screen of the Step 4 to show any requirement that is not applicable to the scope of your QMS and complete justification for it. (5)Explanation for applying ISO 9001:2015 is provided for each step. At the beginning of each step, you can read the “work instructions” that explains your work and the “guide” that explains the relevant part of the ISO 9001: 2015. They are provided in a PDF file. (** 1) Travel and accommodation expenses will be charged additionally if any. (** 1) We will provide consultation with three visits ( three to four hours of consultation per visit ). This product is protected by the copyright law. To utilizing software needs to consent to software license agreement. We can provide another license scheme for a consulting service provider who wants to use this product in his/her service. If so, please contact us. This softwear is provided only for download method. You can purchase it as follows. Click the Click here for inquiry and purchasing the software. , you will move to an application form. Please complete necessary information, and send it to us. You will receive a confirmation e-mail of your application automatically. After getting your order request, we will send you an invoice by e-mail. Then please transfer the fee to our bank account designated. After our confirmation of your transfer, you will receive ID and password necessary to download the software by e-mail. Download and install the software from a designated URL using the ID and the password. *** Because some file contents are stored by PDF file format, you will need PDF viewing software like Adobe Acrobat Reader. *** Some contents are pptx format. In order to display or edit the data, you need Microsoft® PowerPoint® or PowerPoint Viewer. *** Some of the exported data are converted by xlsx format. you need Microsoft® Excel® or Excel Viewer as displaying or editting. Q.1 Is the software provided on a CD or another media ? It is provided through downloading from the Internet. You will be delivered ID and password for downloading it after your payment. Q.2 How can I make a purchase? Please access from “Click here for inquiry and for only purchasing the software” and request purchasing it. When we receive your order, we will send you invoice via e-mail and you are requested to transfer the fee to our bank account designated. After our confirmation of your transfer, you will be delivered ID and password for downloading the software. Q.3 Is the Technofer member discount price applicable to purchasing the software ? This product is not covered by Technofer member discount. Q.4 Where is the downloaded file saved? Or in which folder should a user download the file? The downloaded file is normally saved in the “Download” folder (C: \ Users \ (user name) \ Downloads). If a saving dialog is displayed when downloading, please save it as you like “Desktop” or “My Documents” for your convenience. Q.5 How can I decompress the downloaded file? Q.6 When I launch the software for the first time after installing, I am asked to enter “serial code”, what is this? “Serial code” is a Sixteen alphanumeric characters that is required for software activation. For each purchaser, we issue a separate serial code for each license. You can download the file (serial code.txt) containing this “serial code” with software. Q.7 I installed it on my PC, but can I install it on another PC? You can not. You are limited to installing on one PC per license. It is possible to uninstall it and reinstall it on a different PC. Q.8 During installation, it is detected as a virus by antivirus software and it can not be installed. We are checking it that there are no infections of viruses, but in rare cases, few antivirus software may erroneously be detected as a virus. In that case, please temporarily stop the anti-virus software function and try installation again. Please remember to re-enable anti-virus software function once installation is completed. Q.9 Is there an operation manual? It is included in the software. To access it, please check the operation method by launching the software and selecting [Help] – [Manual] from the menu at the top of the screen. Q.10 Are there explanatory documents? It is included in the software. As you move forward in the software, you will see the explanation on the ISO 9001: 2015 standard and process approach as well as materials explaining how to proceed with the software as “commentary” and “work instruction” at the beginning of each step It can be. Q.11 Can I export data that is created bu this software for using other software? You can export by Microsoft Excel book format (*. Xlsx) or CSV format (*. Csv) (comma-separated text, general-purpose data format usable by many spreadsheet software etc.) in six steps each. 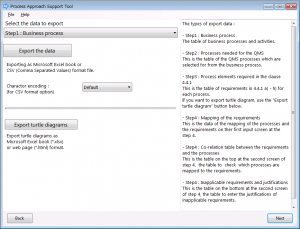 Also, you can output a turtle diagram of each process in Microsoft Excel format.